Marketing Information: The Gold Seal Series amplifiers are designed to meet the rigorous requirements of today's sophisticated sound systems. They combine unique and useable features with ultra high reliability and professional performance. These amplifiers are available in 500, 250, 150, 100, 60 and 35 watt models, each with exactly the same features to provide power and performance no matter how large or small the application. 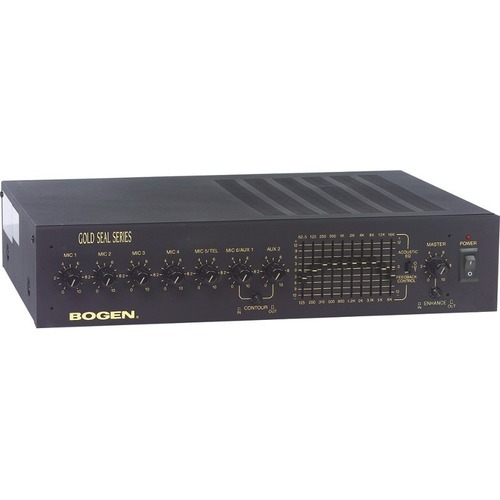 The Bogen Gold Seal Series amplifiers are an extraordinary addition to Bogen's line of quality audio amplifiers. Designed with the sound contractor in mind, they provide unparalleled flexibility and versatility, without the need for add-on modules. In addition to their extensive flexibility, the Gold Seal Series amplifiers provide a combination of features not found in other commercial amplifiers. The Gold Seal Series amplifiers also offer Class D Amplification for increased operating efficiency.